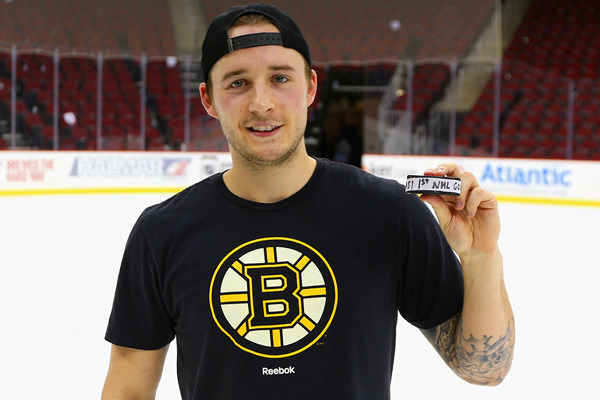 NEWARK - Ryan Spooner had gone 34 NHL games without finding the back of the net. 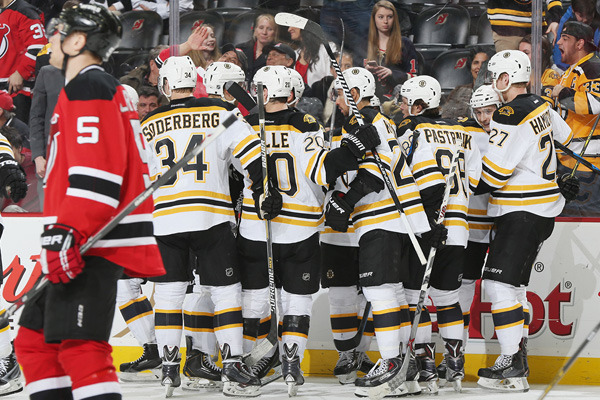 He picked an opportune time to hit the twine, firing in the overtime winner to lift the Bruins to a 3-2 win over the New Jerseys Devils on Friday night at the Prudential Center. The Bruins needed the two points, and Spooner needed the goal. "Thanks," he smiled to reporters when they congratulated him postgame in locker room. "Finally." Boston had given up a 2-0 lead in the third period, with the Devils tying it up 2-2 off two goals just 2:09 apart. Early in overtime, Claude Julien was forced to a call a timeout with his team caught on an icing. It also offered a chance for the bench boss to drive home the message. "He said, 'Just go out there and play, and stick to our game.' And we did that, and scored," said Spooner. Niklas Svedberg, starting between the pipes with Tuukka Rask ill and not able to suit up, blocked away a shot from Martin Havlat. The Bruins got on their horse and went up ice with a four-on-two rush. As has become customary, Boston had been rolling out three forwards and one defensemen in overtime, with the trio of Spooner centering Milan Lucic and David Pastrnak, joined by Torey Krug, on the ice at the time. Krug fed Pastrnak, who moved the puck from the slot to Spooner at the left circle for the snipe over Cory Schneider and under the crossbar at 2:46 into the extra frame. "I was honestly shocked. I was like 'Oh wow, it actually went in,'" smiled Spooner. "And it feels great." The last player to score his first regular season NHL goal in overtime was Steve Heinze on March 28, 1992. That's a special goal, on many different levels. Spooner's previous 34 games had come over the course of three seasons. His first NHL game came during the 2012-13 lockout season, in Montreal. He played just four games that season, and then was called upon in 2013-14 for 23 games when injuries hit the Bruins mid-season. He notched 11 assists. He would occasionally joke that he was a setsup guy, a playmaker, like David Krejci - the player he's now filling in for, with the center on Injured Reserve and sidelined for at least four to six weeks due to a partially torn MCL in his left knee. It took Krejci the first 42 games of his NHL career to score his first goal. But the drought was no doubt wearing on Spooner. Scoring would help him stick with the big club. Besides a five-game stint at the start of the 2014-15 season, Spooner had spent most of the season in Providence. When he got the call because of Krejci's injury, he was a rejuvenated player. It only took his third game back with the team to net that all-important first goal. "I tried to not really think about it, but I'm just glad I actually scored," said Spooner. "They had a shot in our zone, and then missed the net, so just turned it over and we went all four against two," said Pastrnak. "Torey dropped it to me and I just saw Spoons on the side so I just sent him the puck there and he made a good shot." Pastrnak had notched a goal of his own at 1:40 into the third period to give the Bruins a 2-0 lead. After a quick up from Reilly Smith as a power play was coming to an end, Pastrnak skated through the neutral zone, cut to the middle, and found a seam with four Devils converging near the slot and Chris Kelly screening in front. The first fire was blocked away, but the young winger quickly found his rebound and buried it for his seventh of the season. "They played well," Julien said of Spooner and Pastrnak. "Both of them skated well. I liked our first half - because with those young guys in the lineup, too, we were able to roll four lines, all four lines were good." The Bruins have been without Krejci for three games now, and without Gregory Campbell (upper-body injury) for two. Daniel Paille has been skating with Carl Soderberg and Loui Eriksson. For the second straight game, Paille struck first for the Bruins, at 8:39 into the first period. After a 36-game scoring drought, the forward has two goals in two games. Eriksson was strong on the forecheck, sealing the boards and then easily picking off a clearing attempt and feeding Paille on the doorstep. Boston outshot New Jersey 12-4 in the first. The line of Lucic, Spooner and Pastrnak had nine shot attempts in the period and Pastrnak had two takeaways. "The first period was good for us. The second period was not as good, and then in the third there, I think Pasta had a shot in the slot and then to get that goal was good, too," said Spooner. The line finished the night with two goals, including the OT winner, and 15 shot attempts. Pastrnak had a team-high six shots on goal. "Spoons is good skater, so we're trying to skate a lot and be hard on the forecheck and make them make some turnovers so we get some chances, so that's what we focused on," said Pastrnak, who was dogged on the puck all night. "And we have to be heavier on the puck in the offensive zone, but that's what we focused on and we're trying to get better with that." The Devils stole the momentum in the third period, outshooting the Bruins 13-9. The ice was tilted towards Svedberg. At 5:57, Travis Zajac fired one in on the power play after Chris kelly had gone off for hooking. Svedberg pokechecked away Adam Henrique's first chance on the doorstep, but the same play resulted in his bid going through the crease and right to Zajac. Just 2:09 later, Mike Cammalleri took advantage of Dougie Hamilton's clearing attempt bobbling around the blueline, and fed Jordin Tootoo for an easy tally that tied it at 2-2. "Maybe we started backing off to protect the lead and stopped playing a little bit and they got back," said Svedberg, starting his first game since Feb. 10 and just his third game since Jan. 8 (when he shutout the Devils 3-0). He only faced four shots in the first, but was tested in the second and third and made 29 saves on the night. "I think we had a tough stretch there, but we battled through it and after that and in overtime, we pushed hard and got the goal," he said. In the third period, Julien mostly shortened his bench to three lines. He was comfortable with Spooner and Pastrnak. They held their own in all three zones. "Spooner and obviously Pastrnak, with Lucic, their line kept going so it was good that I was able to play with three [lines] and being able to rely on those guys," said Julien. With Krejci on IR, Spooner could be relied upon down the stretch. He'll need to keep playing his game. "When I say 'play his game' - he's got good speed, he's got good skill, he can make things happen out there, and he just needs to feel good about himself and be involved," Julien said earlier on Friday, prior to the game. "Sometimes those little things that seem like not much, make a big difference." "It's exciting to watch a player like that, but at the same time, you're looking for results. So that's not just him - that's everybody, and in his case there, getting his nose dirty in the corners, coming out with pucks, is something that he's worked hard on and I've seen a better Spoons as of late." "To me, he's gotten better in those areas, so I just want to see him continue to improve and so far in the games that he's played with us since being called up, he's showed me that he's a better player that way." Scoring goals helps, too. Scoring important goals helps even more. "It was important for a lot of reasons," Julien said of the win that gave the Bruins a four-point cushion on Florida for the second Wild Card spot. The B's could widen that gap on Saturday when they host the Arizona Coyotes. "There are a lot of teams that aren't that far behind and those two points become important, so I thought it was a pretty good effort. We kind of got into a little bit of a panic mode there in the third period, and they got themselves back in, but give credit to the guys - they found a way to win it in overtime and that's the most important thing right now."